Real property owners sometimes include a descendant, usually one of their children, on their property deed so that when they die the property passes to that individual without requiring probate. A descendant is any direct issue of an individual, such as child or grandchild. Including a descendent on a property deed ensures the property stays in the family. But there are certain circumstances where the descendant must be removed from the deed. Two of the most common reasons are when the descendant does not want the property for financial reasons or when the descendant dies before the property owner. Draft a new deed wherein the descendant to be removed from the original deed grants, or transfers, his interest in the property to you as the other owner named on the original deed. 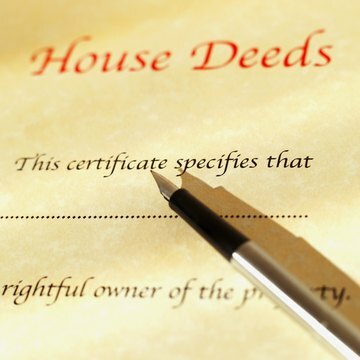 Some states, such as South Carolina, require that deeds be prepared by attorneys. Otherwise, deed forms are often available from court clerk offices, or you can download from online legal document providers. Include the full legal property description from of the original deed and any other clauses required by your state, such as a probate clause. Talk to a real estate attorney licensed to practice in your state or a local real estate agent for guidance. Research your state's signing requirements and make sure they are met so that the deed transfer is legal. The descendant should sign the deed according to your state's requirements. Most states require that a notary witness the signing; others require a notary and another witness. Contact your county clerk's office and ask if you need to file multiple copies of the deed, or if one is sufficient, and ask the amount of the required filing fee. File the new deed with the court clerk in charge of property deeds in the county where the property is located and pay the required fee. Examine the original deed and identify whether the descendant owned the property with you as joint tenants, or as tenants in common. In a joint tenancy, the deceased's interest in the property passes immediately to the surviving owner. In the case of a joint tenancy, it is not necessary to wait for the close of probate to create a new deed vesting sole ownership to you. If, however, the property was owned as tenants in common, the deceased descendant's ownership interest passes to his heirs rather than back to you. Draft a new deed using a form deed acquired from a local real estate attorney, real estate agency or from an online legal document provider. If you reside in a state that requires attorneys to draft deeds, retain a real estate attorney licensed to practice in your state. List the deceased descendant as the grantor. If the property was originally owned in a joint tenancy, list yourself as the sole owner on the new deed. If the property was originally owned as tenants in common, list the heir inheriting the deceased descendant's interest as the new joint owner with your. Include any other information required by your state, including the legal property description from the original deed. Sign the new deed before a notary public. The personal representative for the deceased descendant's estate signs on behalf as the grantor. Research your state's requirements for property transfers to see whether you sign, too, and whether the deceased descendant's heir, if any, must also sign. Have the new deed notarized. File the new deed with the court clerk in charge of property deeds in the county where the property is located, and pay the required filing fee. How do I Change a Quit Claim Deed in New Hampshire After a Divorce is Final? Under Kansas law, there are two main ways to transfer real property outside the probate process: by joint tenancy or a transfer-on-death deed. Since real estate transfers and estate planning are complicated areas of law, you should consult with an attorney for more specific information before proceeding. You may decide as part of your estate planning to deed an interest in your property to an heir prior to your death to avoid probate of the property. There are several methods to accomplish this; however, it is always best to consult with an estate-planning attorney to discuss all options as well as the tax consequences involved. The popularity of living trusts has been growing due in part to the increasing awareness of the probate process. Probate is a court process that oversees the distribution of a deceased person’s property. In California, probate often takes several years to complete and costs thousands of dollars. A living trust is a means of leaving property to named individuals after the death of the property owner without requiring probate. In California, the process of transferring real property to a living trust is fairly straightforward.